A quote I picked up from Johnny Geraghty, Galway goalkeeper in the All-Ireland three-in-a-row team of the 1960s, during the days when he taught me Latin and Irish in secondary school, came to mind this week amid the stampede to judgements across the sporting landscape. "Be not the first by whom the new are tried, not yet the last to lay the old aside." Johnny was a fan of Alexander Pope's line, explaining that a fresh idea wasn't always right simply because of its novelty value, no more than an established concept should go unchallenged because it had been accepted for a long time. Basically, he was advising his class to be wary of extremes, whatever their origin. It always struck me as a sound principle but, my God, has it had its day, not least in much of the analysis of sport. Now, it's all about the last game or two, with opinions swaying so easily that feathers appear more substantial. Joe Schmidt and the Irish rugby team were eulogised to such a degree after last year's rugby exploits that occasional less reverential voices were portrayed as mean-spirited cranks. Now Schmidt is being depicted as a one-trick pony, who hasn't moved his tactics forward. We're told he even got the call wrong over the roof in Cardiff, foolishly deciding for some reason that Irish players might play better in the rain. Given our tropical climate, what could possibly have given him that idea? As for the players, the happy little game of deciding how few of their Six Nations rivals would get anywhere hear the Irish team has been replaced with dark rumblings about beaten dockets and limited squad depth. As ever, the truth is in between the embarrassing fawning of last November and the grim prognosis for the World Cup, which is now a 'must have' in the analytical tool box. And then there's the Allianz Football League, which obviously decided to test how many mood swings it could generate in as short a period a possible. Congratulations - it has probably set a record. The cause is helped by the growing number of former inter-county players peddling their wares on the media circuit. The common aim among many of them is to get as much notoriety as possible in the hope that it keeps them relevant. Of course, there's a trap attached. After all, if you dive in with severe criticism (perhaps even using rehearsed lines) when a team loses a game or two, it's hardly credible to offer a completely different view if they win once or twice. Where to start? Let's try Tyrone, who lost to Kerry and Mayo and drew with Roscommon in their opening three games. Even their own got on the case. Owen Mulligan declared that he was "seething" while watching the clash with Mayo 'live'. He then viewed a re-run and "felt sick" at how Tyrone had been made to look like "wee boys". Six weeks later, the "wee boys" have picked up full points from their last three games and included Dublin on their victims' list. Presumably, Mulligan has made a full recovery from the ailment apparently brought on by earlier defeats by two of the All-Ireland favourites. I'm merely using Mulligan's comments as an example of over-reaction. There are plenty others too, who allow the most recent events to influence their opinion. When Mayo won their first three games, it was portrayed as a clear sign that (a) the long break since last summer had done them good and (b) James Horan's return brought renewed energy. The opening surge was followed by defeats against Dublin and Galway and suddenly it was a case of 'same old Mayo'. That changed again last Saturday night when they beat Kerry - now it's back to 're-energised Mayo'. Kerry won their opening five games for the first time in many years, fuelling predictions that something big was stirring. Yet, after losing by two points to Mayo on a cold, wet night, we were told by former Armagh defender, Aidan O'Rourke that "on the evidence of this weekend, Kerry do not have a collective will to defend and get their teeth into the unglamorous but essential task of scrapping and working to protect their farm. "If that lack of mental toughness wasn't worrying enough, there is a bigger problem. Inexplicably, very few of the Kerry players have the technical capacity to make an effective tackle in one-on-one situations," he wrote on the RTé website. Five wins, one defeat, yet the wheels were off, it seems. And then there's Dublin, now under forensic scrutiny after losing three of six games. It's being portrayed as a sign that they are losing their way in the five-in-a-row bid year. Really? They haven't generated enough momentum to reach the league final for a seventh successive year, but so what? How much real effort have they invested in it? Yes, they would like to win the league again, but if it couldn't be done on limited power, they are not going to worry too much about dropping out before the final. 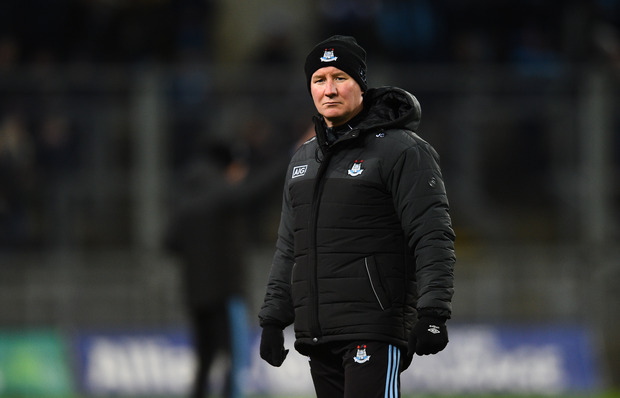 Everything is geared around the five-in-a-row bid his year, so reading anything into what's happening in Dublin now, including Jim Gavin saying "that just isn't good enough" after the Tyrone game, is pointless. Still, it has given those who reach conclusions on short-term results some ammunition. It's blank, mind you, but that doesn't seem to matter anymore. What was the purpose of last Saturday's Kilkenny v Cork game? The GAA's fixtures list described it as a relegation play-off, which patently wasn't the case. The changed League format for next season meant there was no relegation/promotion between the top 12 this year. Kilkenny v Cork was merely to decide which group they enter next year. Enter the issue of the suspensions to be served by Conor Delaney (Kilkenny) and Seamus Harnedy (Cork), who were sent off in the final series of 1A games. Logic suggested they would serve their one-match ban last weekend but, no, the rules state that relegation and/or play-offs games are not deemed to be part of the same competition and could not be used for suspension purposes. Bizarrely, that left Delaney and Harnedy free to play last Saturday, but not in the first round of the provincial championships. Wisely, neither player lined out last weekend, which allows them to challenge their championship ban. Common sense demands that they be cleared. Croker idle on St Patrick's Day? What now for Croke Park on St Patrick's Day? Will it remain idle on the national holiday from next year on? The GAA's Fixtures Analysis Committee have recommended that the All-Ireland senior club finals be played in January from 2020, a proposal that's almost certain to be accepted by Central Council. The fixtures group have also recommended that "the Association consider how best our national games be promoted through appropriate games in Croke Park on St Patrick's Day." But with what - that's the question? The Railway Cups are gone and won't be returning. And even if they did, the public wouldn't respond. That leaves the inter-county scene as the only guaranteed method of attracting a crowd that would make it worthwhile to open Croke Park. Fixing League games for St Patrick's Day, which falls right through the week, would be problematical. It seems like the pigeons might have the place to themselves.